I’d much rather see this service offered for the rest of Metrobus, but you’ve got to start somewhere. 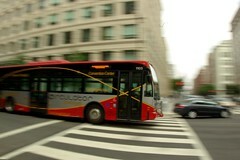 DDOT now offers realtime tracking of the Circulator buses for all WAP-enabled mobile phones. That means you can always see where the nearest Circulator bus is, and whether or not you should just say screw it and take a cab. Not so bad, but where’s this for the rest of the WMATA bus lines? There was NextBus service for a few routes, as it was in beta-testing, but WMATA pulled the plug on that one faster than safety upgrades for the 1000-series cars. Here’s hoping the Circulator isn’t the only line with this kind of availability.